Make the sauce a few hours before serving it so that the flavours can develop. Heat two tablespoons of olive oil and fry the bread till nice and golden. Break it up into the bowl of your food processor. Add another tablespoon of oil to the pan and very gently fry the garlic, red pepper and paprika for about two minutes. Spoon the mixture onto the bread. Reserve a tablespoon of oil and then add the remaining oil, tomatoes and almonds, and process till smooth. With the motor running, drizzle the tablespoon of oil into the tomatoes. Once it is all absorbed, add the lemon zest, and then process again while drizzling in the vinegar. Season with salt and pepper, and set aside. Season the chops with salt and pepper. Heat the olive oil and fry the chops till golden and cooked through. 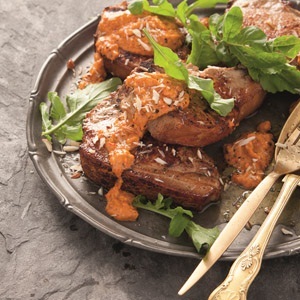 To serve, place a mound of mashed beans onto the serving plate, top with the chops and spoon the warmed salsa romesco alongside. This recipe is extracted from Jenny Morris' latest cookbook 'Taste the World with Jenny Morris'.